- Phil Wong on 二月 23, 2017. 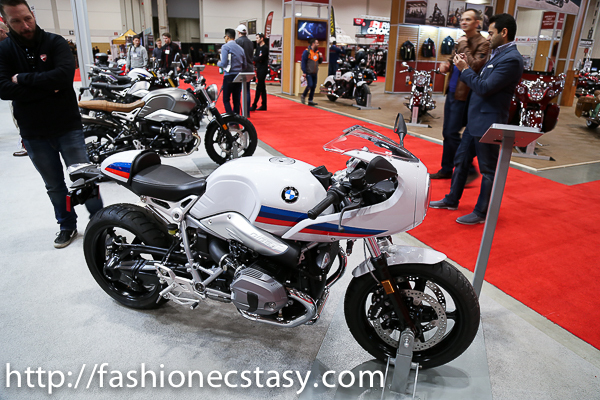 The 2017 Motorcycle Show celebrated its 30th anniversary of Toronto’s showcase in style with Aprilia, BMW Motorrad, Can-Am Spyder, and more. The show features several special events that appeal to riders of all ages and experience levels, making it family-friendly. Yamaha’s Riding Academy for Kids feaatures Riding Skills demo’s with expert Clinton Smout. She Rides Night is a celebration of women who ride. motorcycle stunt shows and Extreme Show feature the Hall-of-Famer’s trials demos with Canadian stars Craig Latimer and Jordan Szoke. This year’s Motorcycle Show kicked off with the introduction of two brand new motorcycles from the Harley-Davidson and Ducati. Harley Davidson’s newest edition of the Road King Special also introduces a brand new engine called the Milwaukee-Eight. The Milwaukee-Eight features a 107 V-Twin engine (1746cc’s), with four-valve cylinder heads, dual plugs for each cylinder, producing a higher compression ratio that will allow it more power and a quicker acceleration. This is also the first engine that is “blacked out” by Harley Davidson. The Road King Special comes with a new front suspension with a rear emulsion shocks that will allow you to ride more aggressively behind the blacked out mini ape handlebars and large headlight nacelle. You have the option of custom styling this bad boy straight from the factory, and it also looks pretty mean in the green version, starting off at $22,899. 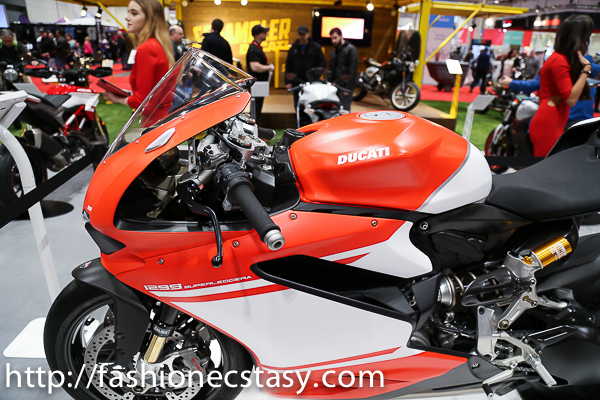 Ducati unveiled its newest edition, the Ducati 1299 Superleggera! This was a “top secret” superbike that will be in high demand since they are only making 500 of them, which explains the $85,000 price tag! Ducati has created their most powerful 1285 cc Superquadro engine, with 220 hp at 11,000 rpm, with a full complement of carbon everything equaling a total weight of 162 kg. My only critique is that for $85,000 you would think it would come with a better paint job? This year’s Honda line-up was pretty impressive! It looked like it would provide the most fun rides, starting with the Honda Rebel 300 going with a different look, kind of resembles a “steampunk” version of a bobber. But I was most surprised to see the return of the Honda CB1100! Or should I say the new Honda CB1100A! For $12,999, I think this café racer will be popular with the mid-life crowd, like myself. At first glance, it looks like they did not change much, but they did manage to update the chrome bezels with a digital readout including gear position, clock, fuel gauge, fuel consumption indicator, odometer and twin trip meters. It looks like a pretty comfortable ride, as it comes with twin rear shocks that are adjustable for spring preload. It also comes with dual disc brakes ABS, which makes this old school ride even better with some of the modern upgrades! Completing the old school look this year is the BMW R nineT RACER. I love this look from end to end. It evokes the sports styling of the 1970’s, tightly tucked in, half fairing, stubby handlebars and an old school paint job from BMW‘s colours back in the days. The R nine T-Racer is the updated version of the original R90S and Slash 6 models of 1973. With a BMW air/oil cooled 1170 cc engine, 6-speed transmission, producing 110 hp; it comes with 320mm twin discs in the front, ABS, stainless steel exhaust and optional Automatic Stability Control. I love these old school bikes with upgrades as it gives you the best of both worlds. The Canadian release dates for this BMW R nine T-Racer is slated for March 2017 and has a price tag of $14,150. 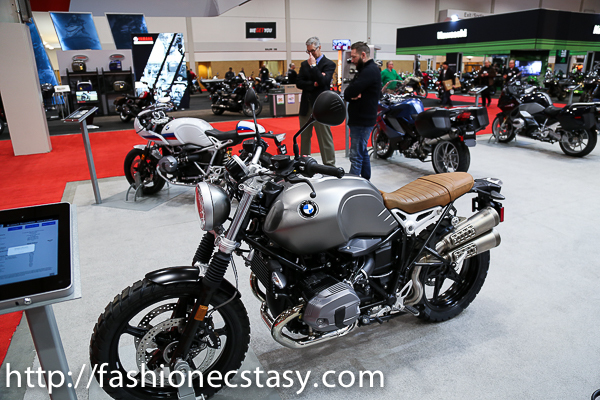 For those unfamiliar with the BMW Heritage line, they have five different versions sharing the same frame and engine, so check out the R NINE T PURE, R NINE T RACER, R NINE T SCRAMBLER, R NINE T and R NINE T URBAN G/S. 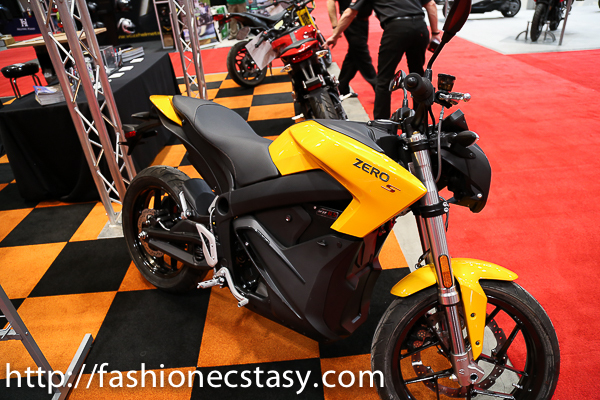 Out of curiosity, I had to see what the electric motorcycles were up to and dropped by a Zero Motorcycles dealer. The base model, the Zero S, comes in 3 versions differentiated by battery sizes and power: the ZF6.5, ZF13.0, 13.0+Power Tank, with the base model going for around $15,000. With the base model getting around 130 km, it will get you to most places. The saving grace is that it comes with a regular three prong charger and can be fully charged in around 2 hours. It is throttle only, which means no changing gears and silent. The maintenance is quite simple as well. You don’t need to maintain much since there is no engine in the traditional sense. Now there are a lot of cool bikes one can get for $15,000, and I think this is one of those bikes. I am looking forward to taking one of these electric bikes for a road test this spring.